The Thanksgiving meal at Red Cloud is an important gathering. This holiday season, help ensure every student has the Thanksgiving meal, education, and care they deserve. 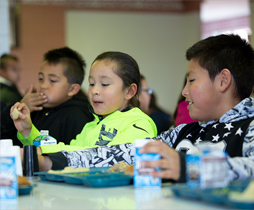 Donate today to help provide a Thanksgiving meal for our 600 students. Verification Code: What is this? Please click 'Donate Now' button only once. It may take a few moments to process your information. If you are having trouble with this form please try again here. Title: Dr. Miss Mr. Mrs. Ms. Prof.